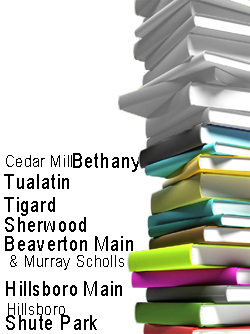 Last week the crew was at the Cedar Mill Bethany library. This lovely library makes good use of their small space, and you can see from the picture that the tagging team almost filled up the childrens' area! In addition to the tags that need to be added to library materials, gates and self check machines are being added as well. 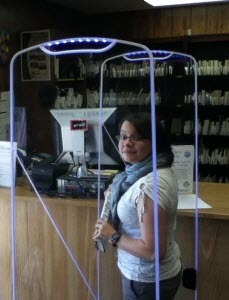 The West Slope Library recently had their RFID gates installed. This picture that West Slope staff shared on their Facebook page of shows off their futuristic new gates. 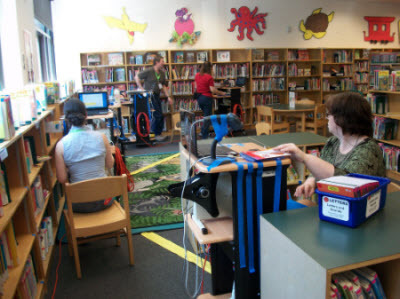 WCCLS is installing Radio Frequency IDentification (RFID) technology in member libraries in order to increase staff efficiency, enhance the security of library materials, and, most importantly, make it even easier for you to use the library.